Participants will explore the advanced and newer features of the Boardmaker Online software. This includes the over 600 templates for interactive activities, student performance monitoring, and Boardmaker Curriculums. In addition, participants will learn how to take advantage of the social media aspects of this new online software. Nicole Paneque is an occupational therapist and a member of the Instructional Support Team at CASE. Nicole has worked as an OT in various districts and programs within CASE, with students in grades K-12. She also supports Assistive Technology consultations and evaluations as part of the Instructional Support Team. 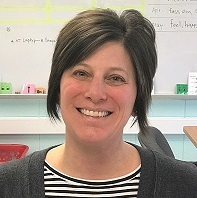 Nicole enjoys collaborating and working with school personnel and students to promote engagement, functional skills, and participation through OT and AT modalities and interventions. Tricia Sharkey is the Assistive Technology Consultant for CASE. She has been an AT consultant for CASE for the past 9 years and is currently RESNA Certified. Tricia is a speech language pathologist by trade. She has worked in both the public school setting and in private practice. As an AT consultant, Tricia often finds herself in conversations with professionals regarding different ways that educators can differentiate for students with differing needs. With many universally available options, teachers have so many tools to differentiate for their students to be successful.